This month’s Art elements theme challenge was chosen by Claire and in choosing white she gave us a very seasonal challenge and great scope to work with which at this time of year is no bad thing. Since December is such a busy month I decided to kill two birds with one stone and use the theme in some of my gift making. My efforts are mostly off-whites and creams since I think bright whites are quite hard to work with and wear. 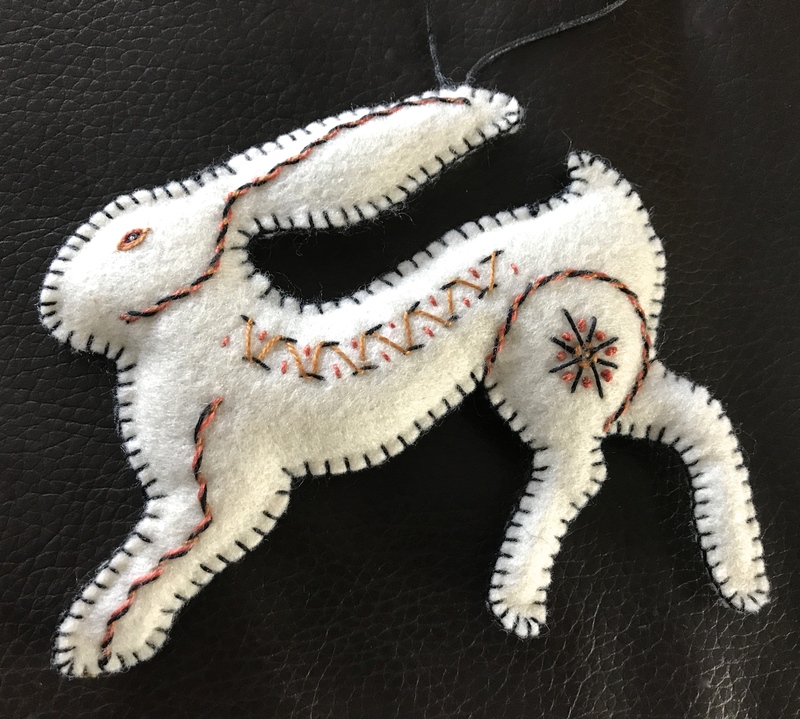 First up was an Arctic hare ornament I made as a gift for a friend… made from felt and embroidered with a folk art design. Simple but effective and I think he was appreciated. 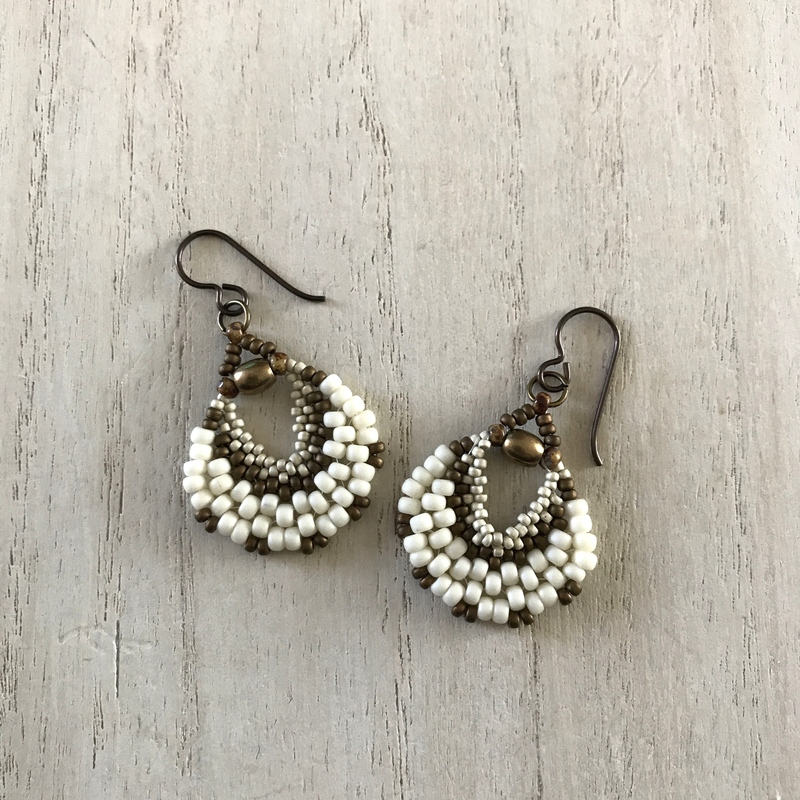 I was very much taken with the bead woven earring tutorial Marsha posted just before Christmas and made several pairs as gifts including this lovely winter white and bronze combination. Having got a couple of quick makes under my belt I did go back to an idea that’s been percolating in my mind for quite a while now. This is my mothers wedding veil which is getting on for 70 years old and made of a very fine silk tulle with embroidered floral motifs. The tulle is full of holes and disintegrating rapidly but the flowers are still in good condition so I’ve been wanting to do something to preserve what I can. I’ve been thinking of creating a piece of visual art by combining the floral motifs with other textiles and embellishing it with some of my own embroidery to pull together the generations but I’ve not yet been able to make up my mind exactly what I want to do. Under the circumstances I decided trying to rush something through for this challenge in such a manic month would not be a great idea so I’m leaving it until I have more time. I did however think it would be an opportunity to play around a bit and just see how I could work with it in a simpler form which might in turn help when I come to a more complex piece. The veil is pretty fragile so I cut around one of the flower sections leaving some of the silk tulle intact and pinned it gently to a piece of linen. 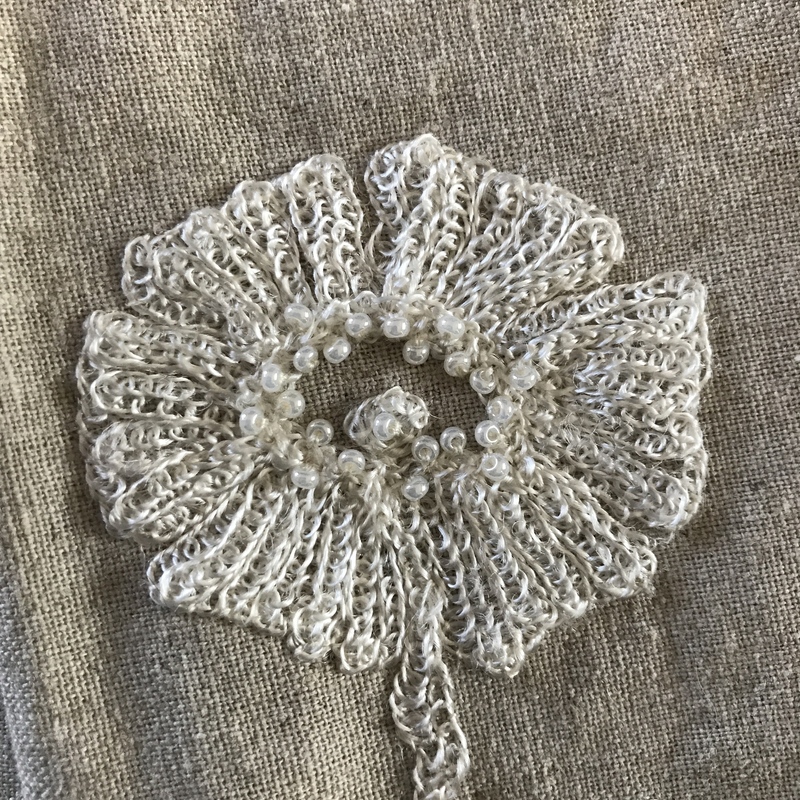 I then found I was able to hand stitch the embroidered sections to the linen and then snip and pull the tulle away quite easily. I did this with a couple of sections of embroidery and them embellished them with some tiny seed beads to add some extra texture. I then made these up into lined draw string pouches and used them as gift bags for my sister-in-law’s Christmas gifts. We’ve been friends since the age of 11 and she knew my mum for many years so it was nice to be able to give them to someone for whom they would have some meaning. She loved them and is using them to store jewellery. Hopefully in the new year I can find some time to sit down and plan a project to incorporate and preserve more of the veil. Many thanks to Claire for inspiring us with this theme. If you’s like to see what the other participants created please join us on out blog hop using the links below. I love the hare ornament, such movement in it, and the earrings are pretty, but the work with the veil is truly special. What a lovely, lovely gift. Your rabbit, earrings, and draw string purse are wonderful! Especially love the way you saved the vail lace. Hare is fantastic! I love the color combo in the earrings, and the bags are fabulous! As usual, a very creative session for you! Loved seeing it all! I love how you took a special object and turned it into a usable object to be loved and enjoyed by people who know the meaning of such a gift. Great job! The hare has pride of place on our fireplace, he’s wonderful. Thank you! 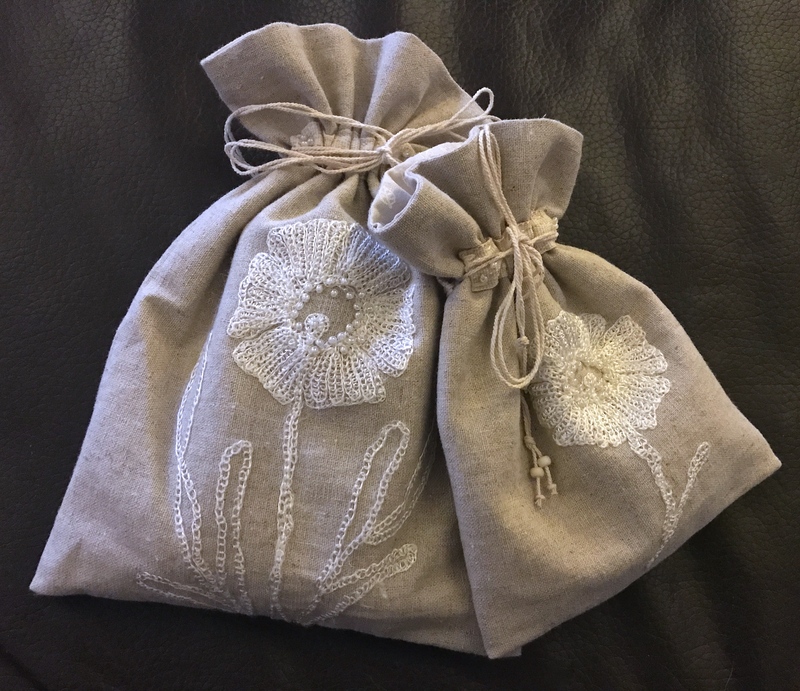 🙂 The bags are gorgeous, I really love how you’ve preserved the embroidery, it’s lovely that you could share it with others to treasure too. I look forward to seeing more of what you create with it! Oh my word! Your contributions to this challenge are really special. That hare is lovely. And, the earrings – squee!! LOVE! But, using your mother’s veil…that’s amazing, and a little gutsy! I think the little bags are wonderful, and I’m sure your sister-in-law will treasure them for years to come. In fact, I can see them becoming family heirlooms. So many special and beautiful pieces! I love what you’re making with the veil, such a great idea! Love the ornament and earrings (I love bead weaving but don’t have the patience for it). What you did with your mom’s veil is awesome! What a way to preserve it for memories! I just love the Arctic hare ornament. It was perfect for this theme. And those earrings are amazing. I have to try making some. I can’t believe how beautiful your gift bags turned out. The embroidery looks stunning on the linen bags. Brilliant idea! I love that you are repurposing your mother’s veil. The flowers are beautiful. The veil must have been stunning when it was new. The linen bags are lovely and so special. Well done! Such a special heirloom, and you’re preserving it beautifully – the pouches have turned out really pretty! I like the arctic hare too – the folk art stitching adds much visual interest to it. As for the earrings, I’m sure the recipients loved them! Your friends and family are very lucky to have received such beautiful works of art. The hare ornament is especially fabulous. All of your creations are equally fab, but I must go with the flow and congratulate you on repurposing your Mom’s wedding veil into a thoughtful gift for an (I’m sure) appreciative giftee who knows the sentimental value of it. Even though i knew what you were doing with the veil – I am blown away. The lace is so delicate and you have incorporated it masterfully. I am glad you SiL will honor and appreciate them! I love the hare! But – of course I do. LOL. I love the Arctic Hare ornament and the little embroidery on it. I love the earrings, too, I wanted to make some of these myself! But the re-purposing of the veil really resonated with me – what a sweet way to keep memories! Oh Lesley… I love everything you did for this challenge!! That hare ornament is wonderful and the beaded earrings are lovely. 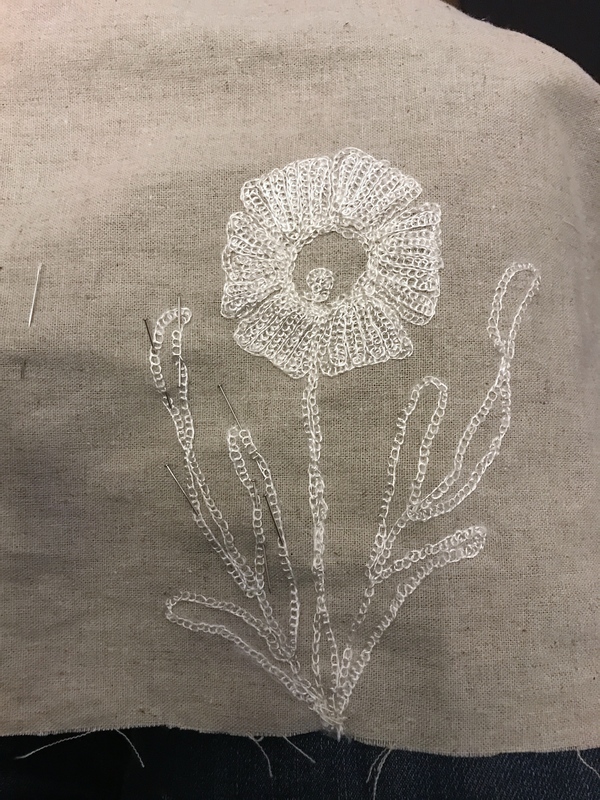 Your thoughts on preserving your mom’s veil were so interesting to me and I’m glad that your first experiments with the embroidered flowers worked out so well and made such a special gift. I hope you’ll share what you end up doing with the rest of the veil when you get there.